Note: This details my very first garden and my very first attempt at gardening. 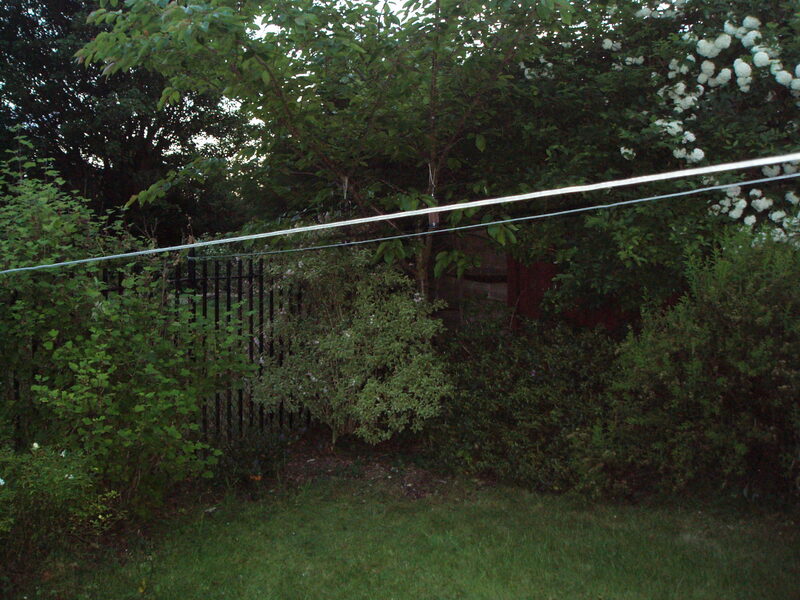 I have since moved house and to a much larger garden. Deep in the middle of winter I moved house. There was so much that needed to be done indoors that I didn’t have time to think about the outdoors at all. Cold, short days meant the curtains that would otherwise look out onto the garden were kept shut and I ignored the outside as I focussed on settling down and making myself comfortable in a new home. Not the most auspicious start but it had to start somehow. 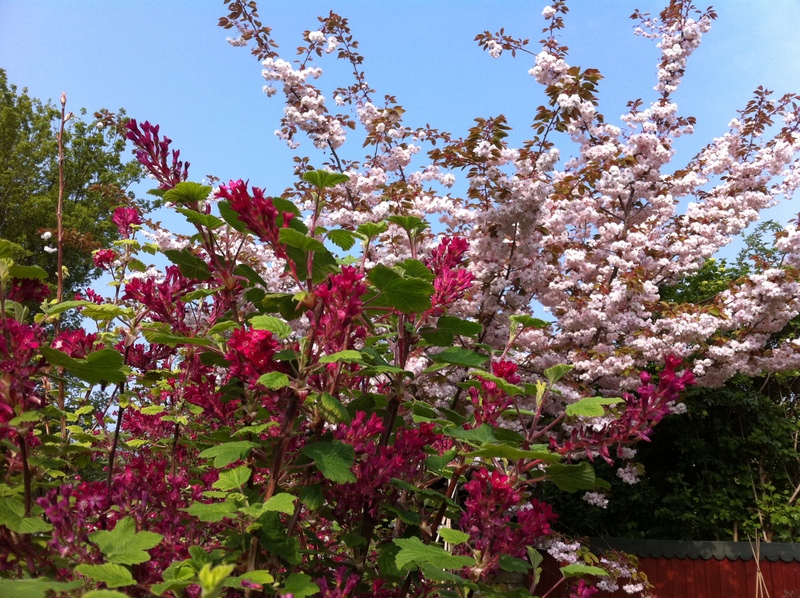 As winter gave way to spring and the weather warmed, thoughts of gardening didn’t really occur until the ornamental cherry at the far corner of the garden blossomed. 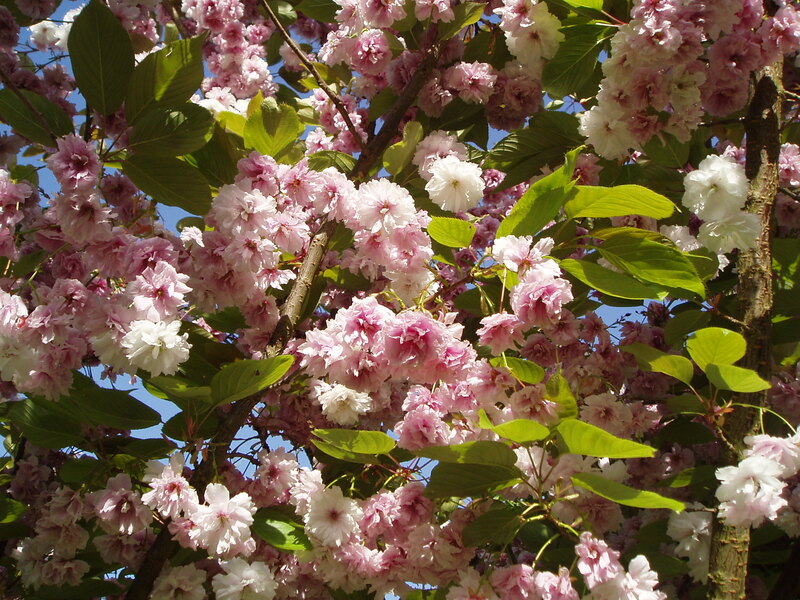 It was just so stunningly beautiful; branches heavily laden with masses of double flowered blossom, opening as a creamy white, flushing pink with age. There must have been thousands of blossom flowers. It was probably around this time and because of the cherry blossom, that I decided that I would take on the garden and turn it from what is was currently back then, to a garden. Suddenly, all the attention, interest and enthusiasm for plants, flowers and gardening that had been building since I was a child finally found release and it was wholly directed at this somewhat neglected patch of grass and weeds. I would be a long time before I could actually start planting new plants. There were climbers that had gone rampant, shrubs gone wild, weeds everywhere and little indication of where the grass stopped and the borders began. It was all rather a mess. The whole lot needed to be tidied and cleared before anything went in the ground. As I am a rather methodical person, I started at one end and progressed along the “borders” until I reached back round to where I started. Some areas were much smaller and easier to do than others – I did those first as a morale boost. One of the very first plants that may have gone in was a grafted wisteria. I have a small group of plants that are my favourite and it is one of them. There aren’t many plants that can compare to a mature wisteria in full flower – I had to have one. After a full summer of clearing, tidying, pruning and weeding, it didn’t feel as though there was very much to show for it; there were no pristine borders full of beautiful flowers and plants like you see on TV. I hadn’t even managed to reclaim all the borders from the weeds. It was difficult to believe there could be so much do so for such a small space – I put that down to a combination of naivety and impatience. There were signs of progress, areas that were once overrun suddenly opened up, we recovered nearly a third of the patio from climbers and the garden was returning to a state where I could actually start planting things. Towards the beginning of the autumn, all the garden centres DIY stores and supermarkets become overrun with bulbs. There are so many that they’re almost given away. I bought daffodil bulbs (mixed) and there were about 200 in all. I had a dream of having a lawn covered in bright yellow naturalised daffodils and this is was I wanted to create. All I needed was a bulb planter an a load of bulbs right? Wrong. Bulb planters don’t work in lawns so we spent the autumn digging up squares of turf, digging the hole left behind, setting in some bulbs and then putting it all back together as best as possible. The result is a lawn that gives a 1 in 4 chance of breaking your ankle from sheer unevenness. It’s not supposed to be like a golf green but it seems that just being reasonably flat is also too much to ask for. We just about managed to get all the bulbs in the ground before the autumn turned to winter and all work outside ceased. 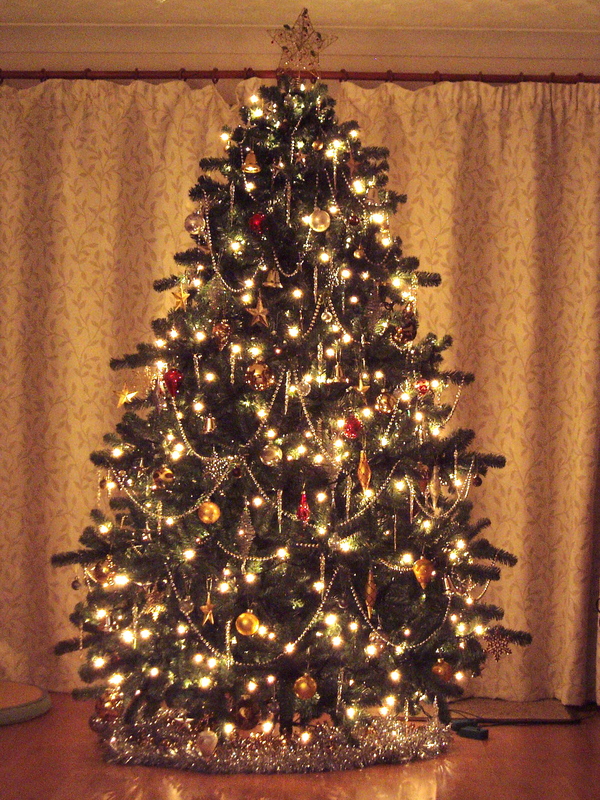 Having missed out on a Christmas tree when I first moved, I was definitely going to have one for this second winter. The garden slept for the winter – and after all the hard work and effort that I put into the garden during the summer – so did I. It was an exciting time as all through February we could see the brave shoots of the daffodils we planted last year beginning to peek above the surface of the grass. They were regularly frosted, sometimes covered in snow and frozen by cold winds that knew how to find the weak spots in thermal clothing. 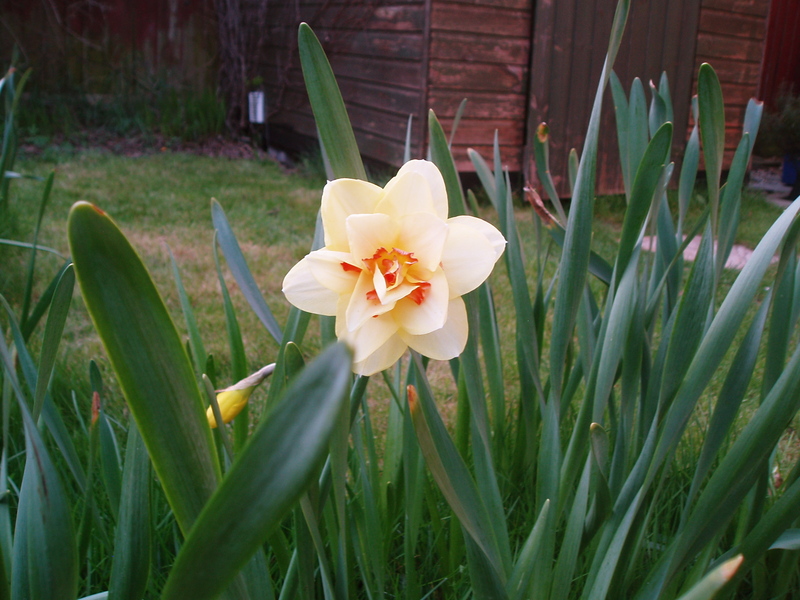 But the winter gave way to spring and the daffodils flowered. I managed my very first (albeit rather small) vase of spring flowers (exclusively daffodils). As the weather warmed and the days grew longer, another growing season was beginning and it was time to get back out into the garden and pick up the threads from last autumn. All the work reclaiming the borders the previous year meant this summer was a planting free-for-all. Plants were regularly bought, usually cheaply, and went in anywhere there was a gap. There was no time to think about design, style or ambiance; if it was cheap, came in a small pot and looked good then it went in. The area around the patio was planted too and it was also pressure-washed for the first time, turning the dirty dark grey into a bright, light-reflecting surface that you could actually walk on without squirming. As well as buying lots of plants I also received many as gifts and they went into the lovingly prepared, newly fertilised and dug borders. The view from the patio doors got better and better I got a real sense of satisfaction from seeing the new plants in their newly created surroundings. During the frantic clearing, weeding, digging, fertilizing and planting there were some moments where I was made to stop and simply enjoy the results of what had been already been achieved. It is important – very important – to simply stop for a while and enjoy what already has been done, otherwise gardening turns into an endless chore with no rewards. There will always be something that needs doing in the garden, but the garden will benefit much more from a rested and happy gardener than a tired and resentful one. While I was relaxing on the patio underneath the jasmine, the wisteria was racing up the side of the kitchen window, following the guide wire we put up when it was planted. I desperately wanted it to establish and run away with itself but I knew it would still be some years before it really came into its own. The birds continued to visit the garden to make use of the free food and facilities, the bees continued to make use of the flowering shrubs through into the autumn and I continued to methodically work my way round the garden, reclaiming the borders – I had almost finished and was making a last desperate attempt to get to the end before the weather deteriorated as autumn moved into winter. I just about made it – the end point was the shed on the right. The east-facing border was the last but largest border that needed to be reclaimed and it was finally finished round August after nine large bags of compost, half a large tub of bonemeal and a box of Growmore were dug in. The fence and shed were also given a coat of paint to smarten them up. 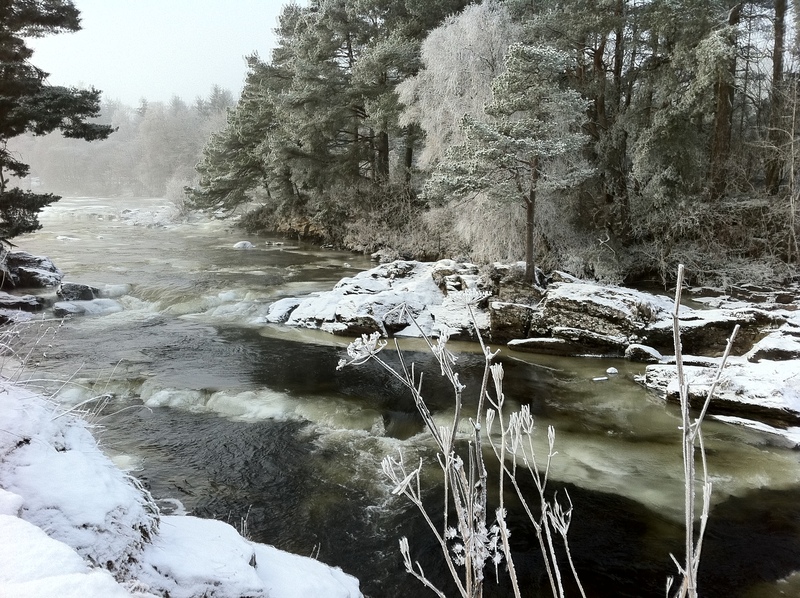 This particular winter was noted for its very early arrival and the chaos it caused when the snow arrived in late November and didn’t leave until after the new year. It was colder than average and with the thick lying snow, lots of plants succumbed and died. I was very anxious about many of the plants that had just been planted this year and of course, the young wisteria. There was no way to tell what had died until the next spring. Spring didn’t start off very well at all. The daffodils were pretty much a no-show, we had lots of leaves but just a small handful of flowers. Then the large evergreen hebe that was here before I was, died as did a lovely (and hardy) fan palm that I planted two years ago. Several other smaller plants also didn’t make it through the winter. The season started with a sense of loss. A harsher than normal winter was made up for with a very warm and early spring. It caused the cherry, currant, skimmia and spirea to come out in flower together. The garden is very much a spring garden, with most of the flowering over by June. Having all these shrubs out in flower together was great motivation and I returned to the garden, encouraged by the wildlife and flowers and with the main work of clearing the borders done, it was time to start filling the spaces with plants. Buying lots of plants from the garden centre can be expensive. A very cheap way of getting lots of plants is to grow them from seeds, a free way is to take cuttings and these are exactly what I did. 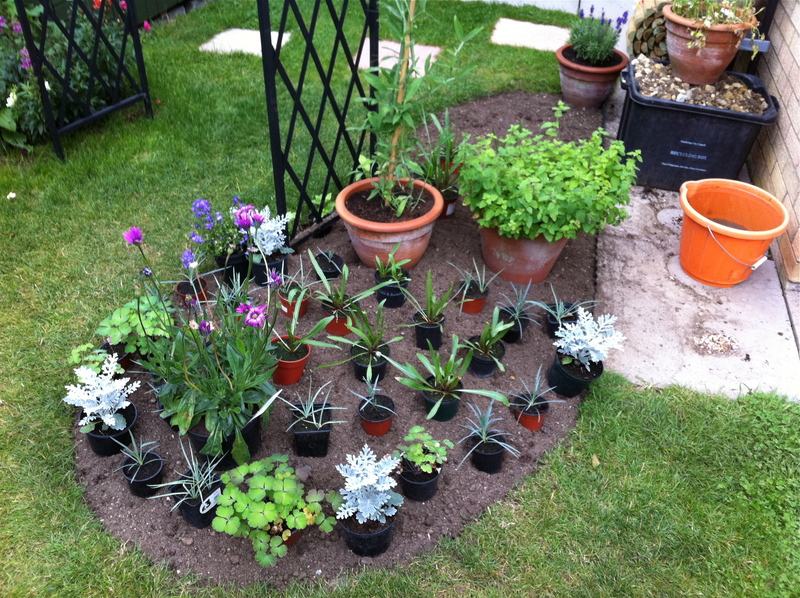 I started all manner of plants from seed and also experimented with taking cuttings. By now I had a small plastic green house with four shelves I could use to start germination. I sowed so many seeds and took so many cuttings that the existing border space was not enough to fit them all in and so began the task of expanding the width of the borders to accommodate more plants. Grass came up to make way for two new borders. Lots of different plants went in but the difference this time was that there was more of a plan in my mind. I thought a bit more about the colours of the flowers and texture of the leaves. I researched the type of plants I had grown and put them where I thought they would grow best. There was less of the haphazard planting of the previous years and bit more time to think about what I wanted where – although I wasn’t totally immune from making impulse buys (such as 75 cheap gladioli bulbs that I scattered everywhere and now wish I hadn’t). By the middle of summer the garden was beginning to look beautiful, there was wildlife, flowers, there were no weeds, there were no large areas of bare soil, the borders were lush and green. The hard work of the previous two years was finally beginning to show. The cycle of sowing, germinating, potting on and planting has turned full cycle once more and I am collecting seeds now for next year’s new plants. Autumn is also the time for planting spring flowering bulbs and I fell for the lure of cheap bulbs once more. 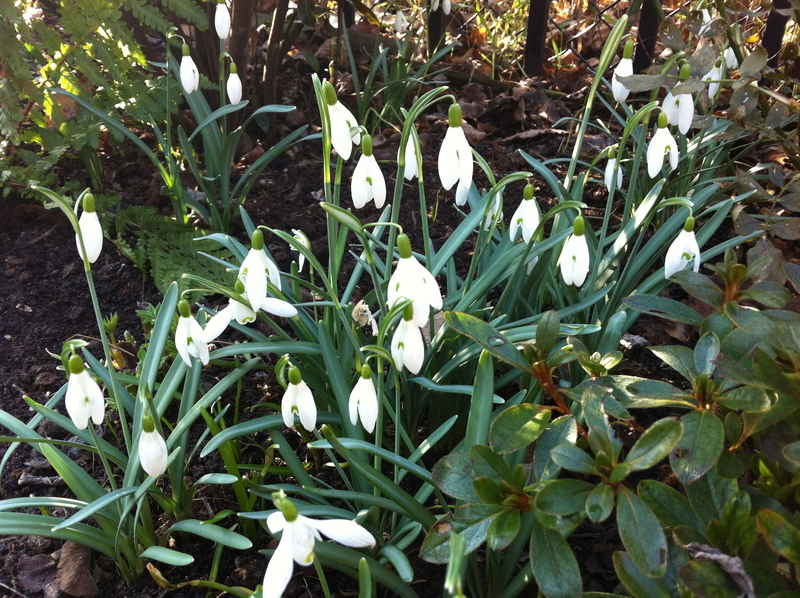 Many alliums and lilies will be added to the garden as will many, many snowdrops. They are yet to arrive and the days are drawing shorter and the nights are noticeably cooler. With the sheer number of bulbs that need to be planted I expect it will be well into late Autumn and early winter before I finally follow my garden into winter hibernation. This winter seemed to be a complete opposite of the previous. Apart from a very brief snow flurry for one morning in December the weather has been very mild and even warm. The first time the greenhouse iced up was in mid-January and that was only the third time we scraped ice off the car in the morning. 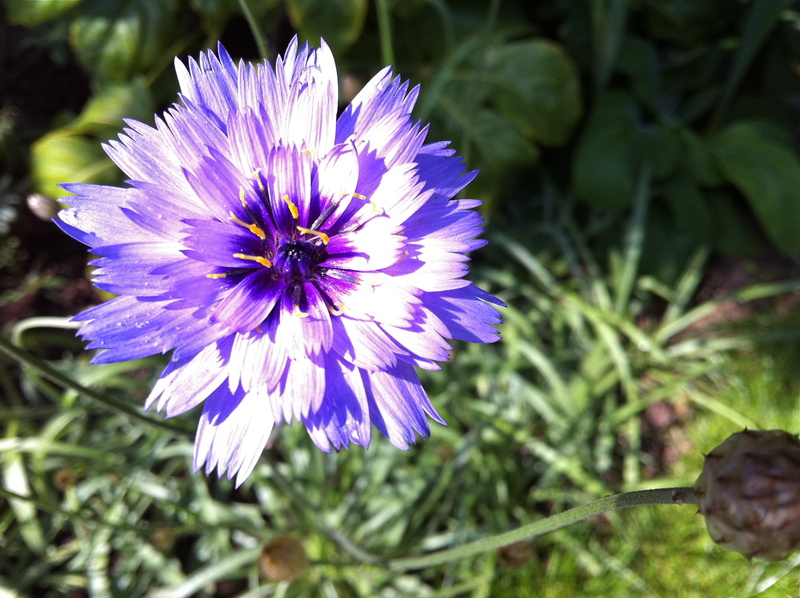 The plants have been getting it easy and some have even dared open a few spring flowers to test the weather. Most of the garden is resting but some plants – such as the Sarcococca Confusa – are winter flowering and with the snow drops, the year of continuous flowers was complete and is now renewing again for this coming year. The garden is emerging from the mild winter we’ve had at full speed. This year, March has been an incredibly busy time for me. All the borders were shaped and re-edged (usually expanded). Then, several hundred kgs of well rotted – and hand-sifted – manure has been used as mulch and mixed into the soil in places. Another garden arch went in and they were planted with roses, a few clematis plants went in as well as lots of bulbs. It’s been frantic but all the hard work is slowly coming to an end as I’m ticking off the jobs one-by-one. After this mad-dash of gardening, I’m looking forward to putting my feet up a little and taking more time to enjoy the flowers of my labour in the coming year. The summer will go down as being one of the most wettest and miserable in a very long time. After previous years of low rainfall, the whole country was inundated with rain and more rain. Following the rain was yet more rain. Despite this, the garden filled out rather beautifully, the roses began their ascent up the arches and even a few of the clematis flowered, so it wasn’t all bad. The new and expanded borders were filled with flowers and we were rewarded with many stunning flowers, all helped along by the rain and enriched soil. At the beginning of the year, I decided to take one picture each month, from the same spot, looking out onto the garden. By the end of this year, this would give me a series of twelve images that would become “A Year in the Garden“, showing the cycle of the garden as it rises from the winter snows, grows to its flowering zenith in the Summer and then gradually becomes dormant and returns to the soil for the winter once more. 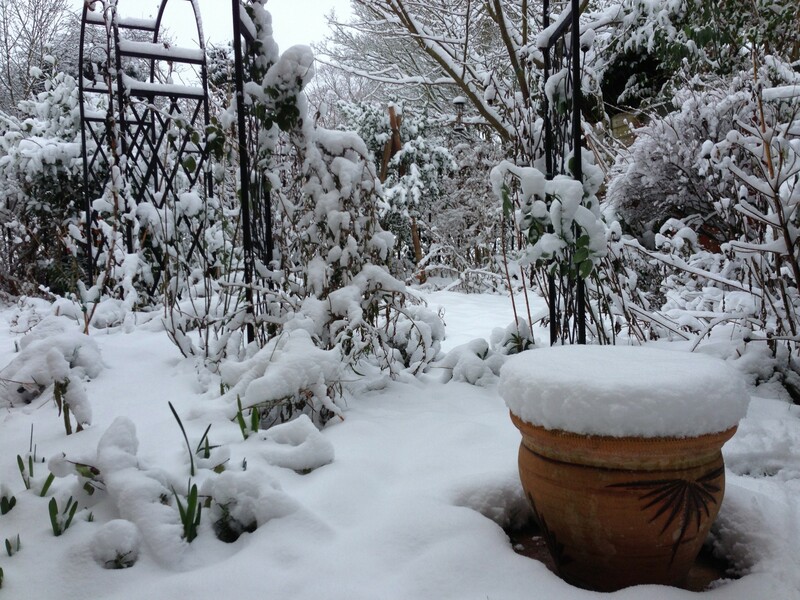 The winter wasn’t terribly harsh, but it lingered and went on well into March with a late and surprisingly heavy snowfall. Spring was delayed by weeks in all areas of the country and the flowering patterns of the early flowering shrubs and plants was completely thrown out of kilter. Frost was still a real possibility even in late April/early May. For this winter season, many plants were sheltered in a temporary walk-in plastic greenhouse that sat in front of the patio doors. This stayed, blocking the view for the length of the extended winter season only coming down in mid-April. Even then it was a gamble whether we would be hit with further cold weather. The greenhouses were a boon to the plants inside them, protected from the freezing winds the high survival rate meant a glut of plants to have to deal with once the weather began to warm up. Spring didn’t “spring” but rather stuttered and faltered with reluctance or malaise. Winds would quickly revert back to northerlies and easterlies turning a promisingly sunny day into a cold and miserable one. Brief windows of warmer weather allowed me to pressure wash the front, sides and back (once the greenhouse was finally taken down). With the patio finally restored, I could deal with the serious glut of plants that had come through the winter. Even then, planting out was delayed due to cold, wet weather leading to cold, wet soil. The whole season was delayed, but once it got going, it raced ahead, leaving me to catch up with a long list of jobs that should have been done weeks ago. The summer won’t be noted for being the warmest, most pleasant ever experienced, but it will be remembered as the year the garden reached new heights. The wisteria had more flowers, and grew to reach the patio doors, the roses reached the top of the arches, the Banksiae Rose sent up a single cane that reached the third wire runner in a few months, the cherry blossom, lilies, delphiniums, roses, everything was more spectacular than ever. The garden was maturing after several years of rapid change and it was beautiful. Despite the lacklustre summer, the garden bloomed and it I took every opportunity I had to enjoy it. New plants were maturing and filling out their spaces and I could see my nebulous plans coming together for a garden crammed with flowers in every corner. 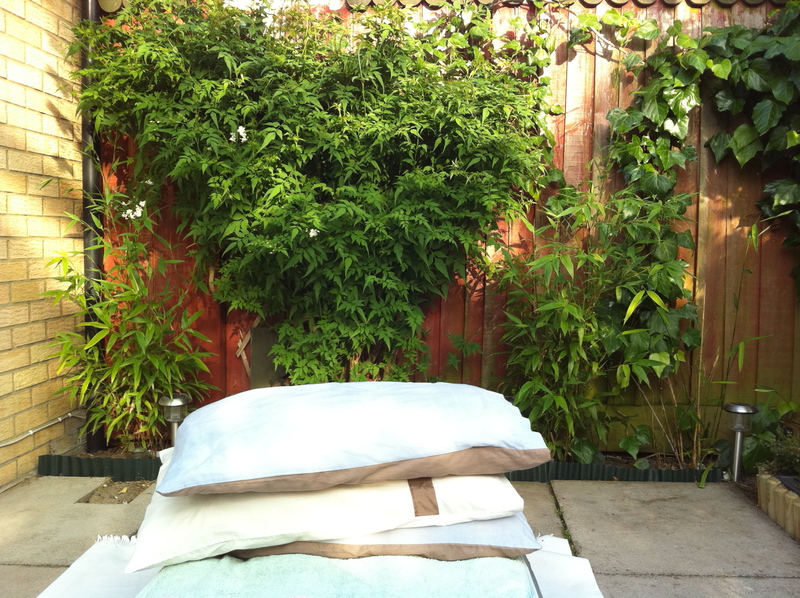 The Autumn of 2013 is the time I stopped all normal work in the garden forever. 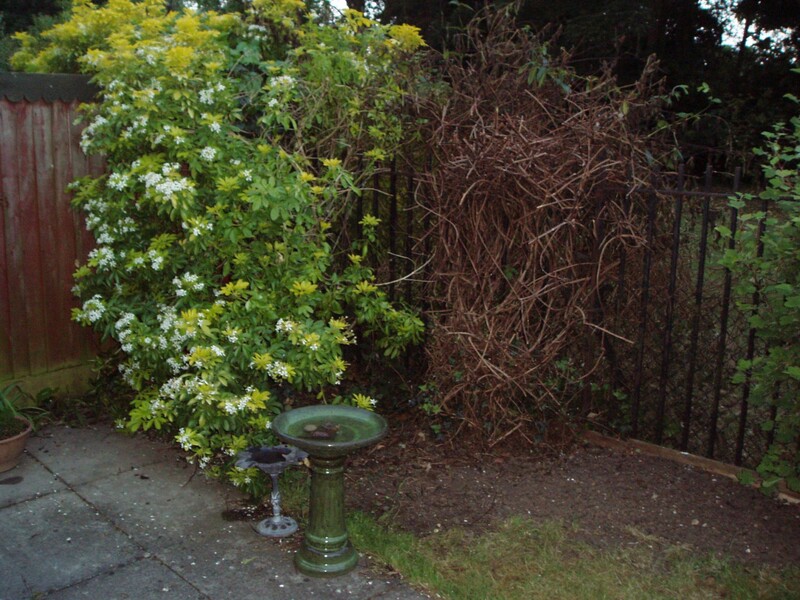 In an ironic twist, we would be leaving this tiny garden as it was just beginning to mature and move to a much larger garden, but one that was in the same state as this one all the way back when I first took it on in January 2009 – a new blank canvas. After years of complaining that I never had the space for all my favourite plants, I finally got what I wished for, but the price was to leave this garden behind. As the sun set on my stewardship of this garden, it was a tremendously bittersweet time. Though I was able to bring along several plants to the new garden, mature shrubs, my beloved wisteria, Banksiae Rose and many others had to be left behind. The thought of starting all over again but in a much bigger garden was both thrilling and daunting. 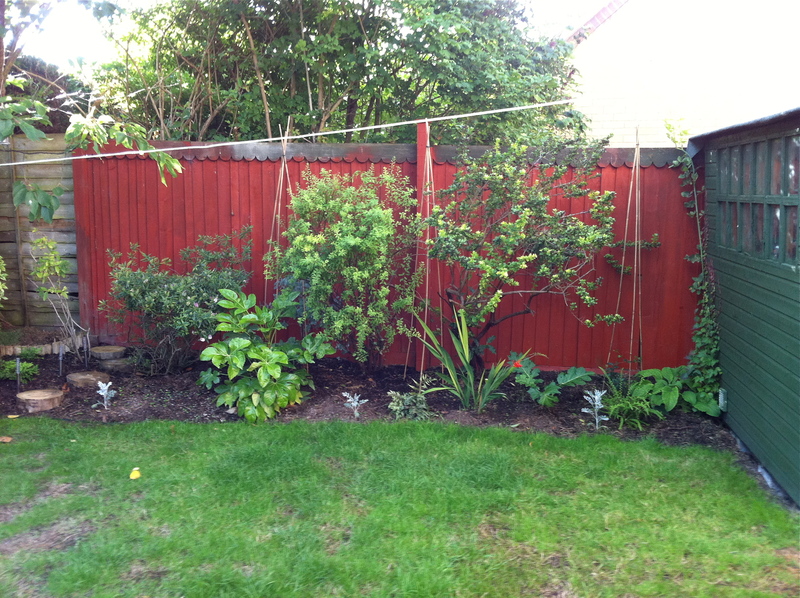 The sadness of leaving this “old” garden warred with the excitement to begin afresh on a much larger “new” garden. It was with a deep sadness that I prepared the garden for its winter hibernation for the last time. The house move process was stressful and protracted and it was only in early 2014 that we had a confirmed completion date and thus began a definite countdown. The time left living our old lifestyle was first measured in months, then weeks, then days. As part of packing for the move, some plants in the garden were lifted, others were divided, most remained. On the very last day, cold and grey with a steady rain falling, the removals firm emptied the house as I quietly whispered, “goodbye” to the garden as it slept, waiting for spring. It would wake to a new pair of owners, just as the new garden would now wake to me.